Selfgraphy Pro is a Biography WordPress theme which is designed to create a strong online presence. 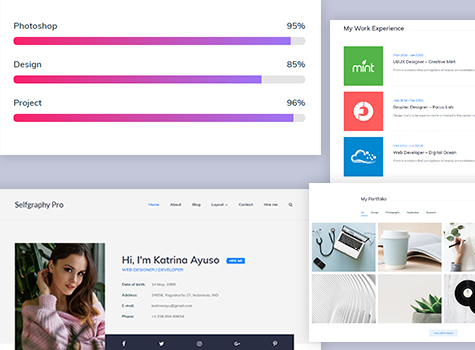 With Selfgraphy Pro, you will be able to find multiple and creative options to showcase your different skills, planning and work experience. It comes in multiple colors and layouts to support you and your organization’s branding. Additionally, it also comes with a wide variety of options so you can modify the layout, styling, menus, breadcrumb, widgets and much more, directly from theme customizer. This theme is translation ready and major browsers supportive. Hence, it’s the perfect theme for the uncompromisingly creative souls who know what they want and simply need a set of tools that allow them to craft their dream websites, without having to write a single line of code, and with endless visual, graphical and behavioral possibilities to fine-tune directly from theme customizer. 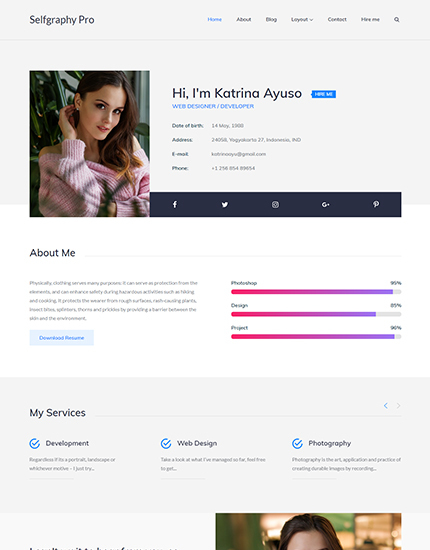 With its clean typography and simple design, Selfgraphy Pro as a biography theme can help you communicate with your visitors easily. The theme has a clean and straightforward design so you can perfectly reflect your skills and best qualities to maximize the impact and sensory power of your website. Selfgraphy Pro can be easily used to showcase your resume and work. 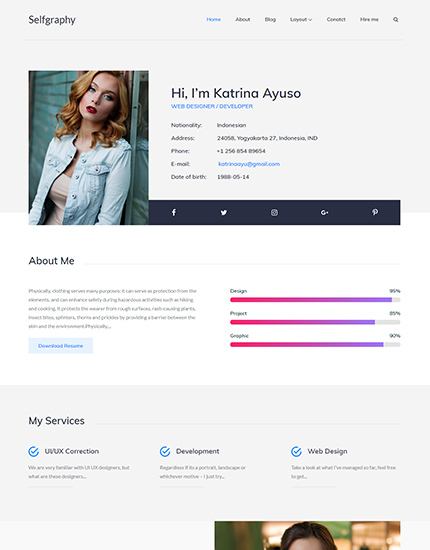 It has been designed to accommodate the needs of a wide audience who need a professional and stylish online resume or vCard style website as its main purpose is to help you create a unique site to showcase your talents and expertise. Moreover, it includes built-in sections so you can easily share your thoughts and knowledge with prospective employers and partners. Selfgraphy Pro offers an excellent readability to the readers and website visitors. 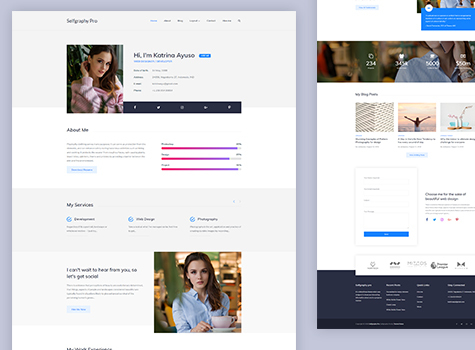 It has a design that will help your online resume stand out from the competition and its fully responsive design will make sure your website looks appealing to prospective clients and employers, how ever they’re accessing your online resume. It is also translation ready and major browsers supportive. Moreover, the theme supports unlimited color variations and comes with tons of customization options. Thanks to the easy customization tools and settings, anyone should be able to adjust the demos to match their preferences as it comes with multiple page layouts, several custom widgets, and unlimited color options. It is also easy to set up and can be customized using live theme customizer.